Colombo, Sri Lanka -- As Asians, we sometimes forget that the teachings of the Buddha actually have nothing to do with Asia or Asian culture. We were born into Eastern cultures where images of the Buddha and Buddhist rituals and teachings are commonplace and, therefore, natural to us. In the West, however, Buddhism is a relatively new teaching, brought there as late as the 1950’s and 1960’s by the early Western Zen teachers. From those early days it has gradually made its way into the mainstream culture, but not completely. We still have much more work to do in order to fully integrate it and make the Buddhist temple as familiar a sight as the Christian church or the Jewish synagogue. 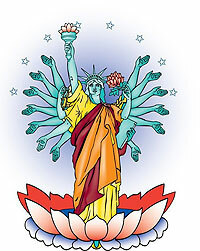 With the arrival in the West of the so-called “Baggage Buddhists,” the immigrants who brought their religion with them from countries such as China, Vietnam, Tibet, Korea, Thailand, Cambodia, and Sri Lanka, for example, the New World became increasingly more exposed to Buddhism and Buddhist iconography. The monks from these countries soon followed the immigrants to establish temples that would cater primarily to the religious needs of these groups, with emphasis on the cultural traditions that accompanied them. It took a while for the various ethnic Asian monks to learn English (if they ever did, and unfortunately many still haven’t), and Westerners were somewhat made to feel welcome, but their presence was – and still is – rare in many Asian temples. In the early days, those Americans and others that were brave enough to show up in the various Asian temples were not taught the difference between the Asian culture of the temple – and the teachings of the Buddha. • The Buddha’s teachings are universal and for all places and all times. 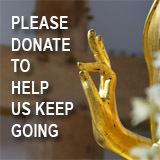 The first thing we have to do to integrate Buddhism into Western Culture is to make this fact known – loud and clear. We should try to keep the Asian cultural symbols and artifacts to a minimum in our temples, learn English, and learn our host Western cultures so we can adapt to them – instead of the other way around. • Most Westerners first approached Buddhism though their attraction to meditation; this is still the primary draw. The monks in all temples should be fully-versed in this subject, and well-trained in the art of training others in the practice. • The monks in the West should also teach the practical benefits of Buddhism, and not just meditation. The Buddha offered us countless ways to practically improve our lives, and these ways need to be taught to Western students. • It is very difficult for a Westerner to become a Buddhist monk or nun. In my 36 years in America I have only ordained two American men as monks (it is interesting to note that I have ordained 15 women as nuns). Being a Buddhist monastic in America is a drastic and unfamiliar path for Westerners to take. 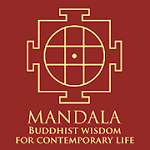 Thirty-two years ago I instituted a three-step pathway for ordaining lay people as fully-certified Buddhist ministers (Bodhicari), which are comparable to Protestant or Jodo Shinshu ministers. This system has been very successful, and we now have many excellent, highly-qualified male and female lay ministers who can teach Dhamma classes, conduct weddings and funerals, give meditation instruction, and serve the Buddhist community in a host of useful ways. The three-step program is based on progressive levels of Buddhist education, commitment, teaching experience, and Precepts. • An important reason this system has been effective, and has attracted dozens of initiates, is because we early-on recognized that Westerners are independent by nature, and do not like to depend on others. Asian Buddhist monks, however, because of our cultures, are dependent on our ethnic communities for support (e.g. food, donations, etc.). The lay ministers we have ordained have, for the most part, maintained full-time careers while they perform their ministerial duties on the side. • Finally, Asian temples must learn to appreciate the female members of their congregations, and give them equal status with their male counterparts. At my temple I make a point of assigning key roles to females during ceremonies, such as having a young girl carry the relics on her head during a puja procession. I know that in Sri Lanka this is contrary to custom, but I feel that we must expand our acceptance of females in all facets of society, including temple society, which I’m certain is something the Buddha would have intended for citizens of the 21st Century world. The above examples are just some of the ways we can begin to more fully integrate Buddhism into Western culture; I’m sure there are many more. I continually attempt to educate the Asian Buddhist clerics in America on this subject, and more and more I am able to sway them to an understanding of the realities I have expressed above. I invite you all to think of new ways we can reach out to our Western friends, and please let me know your ideas. Ven. Walpola Piyananda will be presenting this as a paper and speech in Taipei next week at a conference at Taiwan People's University.